My friend Laura Kelly recently sent me the most darling cake topper Sizzix die to try out, from the Where Women Cook line. Her happy mail also included some fun 12 x 12 scrapbook paper, from the same line! I'm a Sizzix newbie but I love all the possibilities they offer when it comes to paper crafting. Here I created a topper that I used for my cupcake, and used the Where Women Create scrapbook paper for a cupcake wrapper. I can't say "Hooray" without smiling! And this darling Sizzix die just makes the word that much cuter! 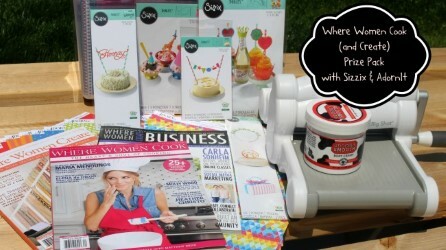 Wouldn't you love to win some goodies from Sizzix and Where Women Cook? I've got something fun for you... How does a new Sizzix Big Shot sound? Not to mention, all the fabulous prizes that you see below! Enter the contest to win these awesome prizes by clicking here!